During the past decade, global communications have changed dramatically, as a result of the increased use of information and communication technologies (ICT’s). ICT’s are becoming increasingly necessary if countries are to compete on a global scale. It has also been widely acknowledged that ICT’s have the potential to play an immediate role in the quest for sustainable and equitable development in Third World countries. ICT’s allow people to collect, store, process and access information and/or communicate with each other. How people in developing countries use these technologies to solve problems, organize their activities and realize their own objectives will determine the impact that these technologies will have in the course of their development. ICT’s are realities and concepts that have become unavoidable for anyone involved in issues of development and sustainability. However, access for women and especially rural women to ICT’s cannot be assumed to naturally occur. According to various authors and organizations most of the positive effect of the “information revolution” has bypassed women. It has not been easy to determine whether women have benefited from the information revolution. There is also the consensus that very little research has been done on women’s information needs and access to appropriate information in developing countries. It is therefore necessary to examine the impact that ICT‘s are having on women and whether or not they are serving women’s needs and preferences. It is also necessary to examine ways that policies can be put in place in order to assure that women have access to the technology, which is necessary to fulfill their information needs. This chapter, using case-studies from Africa, will examine the above issues. During the past decade, global communications have changed dramatically, as a result of the increased use of information and communication technologies (ICTs).1 ICTs are becoming necessary if countries are to compete on a global scale. It has also been widely acknowledged that ICTs have the potential to play an immediate role in the quest for sustainable and equitable development in Third World countries. ICTs allow people to collect, store, process and access information and/or communicate with each other. How people in developing countries use these technologies to solve problems, organize their activities and realize their own objectives will determine the impact that these technologies will have in the course of their development. In Africa, access to information, communication and technology is often limited, especially for people living in rural areas. One reason for this is the majority of ICT’s are located in urban areas and those who do have access are often the educated working class. But access among the poor and rural classes is critical for development. The object of ICT’s is to create conditions in which the poor can generate, understand, have access to and creatively use technologies to satisfy their basic needs. Basic needs can be defined as “the minimal requirements for sustaining life: adequate nutrition, health services, water and sanitary facilities. Also implied is access to elementary education and information to enable individuals and communities to be productive and make rational use of the basics good and services available” (IDRC, 1997:35). The complete picture of poverty alleviation is a complex one and widely understood as a serious challenge. ICTs may have a role to play in the process of poverty reduction and can possibly offer new opportunities for impoverished African to improve their daily lives. By providing improved access, enhanced sharing and timely delivery of information, ICTs may be able to empower people to take action. The importance of ICTs to transmit and disseminate information for development in Africa is now being well recognised. However, the impact of ICTs in African society and elsewhere in the third world has not been uniformly beneficial. “The information highway is still predominately male-oriented” (Huyer, 1997:5). In assessing and promoting women’s access to and use of ICTs in Africa, it is important to understand the gendered nature of the social and economic systems which frame opportunities for women. Women’s needs for information are structured according to their gendered roles and responsibilities, which in turn may influenced their use of responses to ICTs, (Huyer, 1997). International Development: Development is a term which covers a variety of different processes and activities aimed at improving an individual or a community’s standard of living. 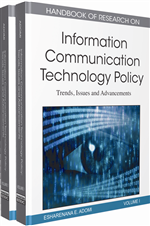 ICT Policy: A National ICT Policy is a policy put into place by governments’ and stakeholders’ who are committed to the process of bringing digital technology to all individuals and communities so that they can have access to information. Engendered Policy: An Engendered Policy is one that recognizes the needs of women, without ignoring the importance of including men in their policies. Empowerment: Empowerment is a process aimed at increasing the social, economic and political strength of individuals and communities. Information and communication technology (ICTs): ICTs are various mediums that can be used to transmit information. They can be divided into modern methods such as; the computer or other digital forms as well as traditional methods such as oral, print, theatre, to name just a few. Gender: Gender can be defined as the characteristics of women and men which are socially determined. These characteristics can be influenced by many factors such as culture, tradition and religion.